Ramblings of an Impatient Artist: Go Bolts! It's Dare To Be Sassy Thursday! Our theme this week is "Support Your Team", meaning make something brilliant using your team's colors and or course a Sassy Studio Designs. I used the new Powder Puff Sassy (without her zombie make-up this time lol). This was a great week to do this project - our school district just had their Homecoming, prefect timing. We're the Northmont Thunder Bolts, our colors are green, white and gold. There's a great company out of Columbus called Dare 2 be Artzy that created custom school designs for our school and a few others and made them available at Scrap 'N Friends. I've been looking for an excuse to use them. 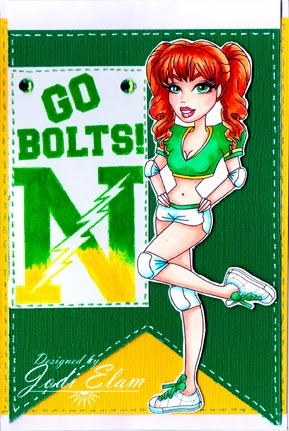 This was created with a great new shaped card by Hampton Art, colored with Copics and I even drug out some Close To My Heart inks to stamp the "Go Bolts" and the "N". Make sure to stop by the Sassy Studio Designs blog and check out the other fun creations by my sassy bro and sistahs! Thanks for joining us at Artistic Inspirations this week. Jodi, this is fantastic! Love the school colors and that textured paper is really cool. Gorgeous coloring too. Jodi, what a bright & beautiful creation! I love it! Great colouring! Thanks for sharing with us at The Crafting Cafe this time! Fun card, love the cut out image and the fab colour scheme! Thanks for joining us at the Doodle Pantry Digital Challenge #39!